There are certain things about Jonathan Van Ness that are not, for any of his followers, very surprising. 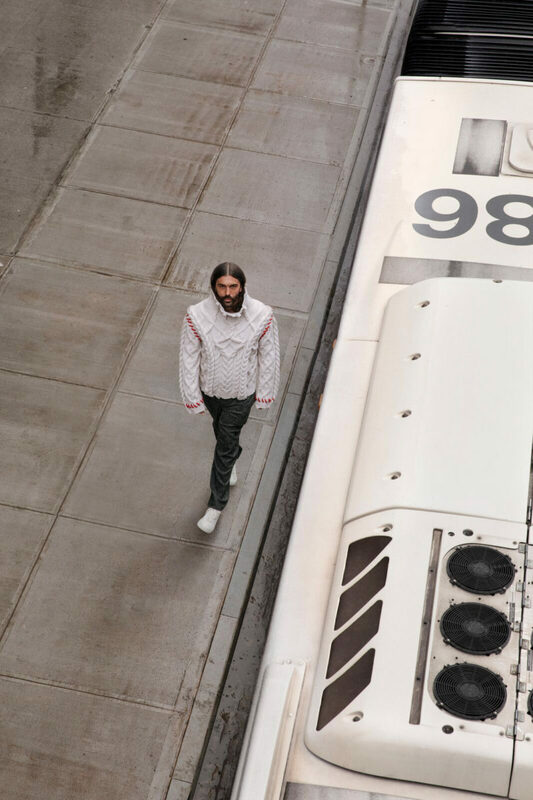 From his voice to his hair to his wardrobe, Van Ness models this flexible masculinity in very physical ways, both on the show and in his day-to-day life. But that’s not exactly new; feminine-presenting men have been working (werking?) their way into the mainstream for decades. What’s much more revolutionary, particularly for television, is the emotional core of both Van Ness and Queer Eye. Instead of embodying the “catty” or “diva” tropes that we often see, Van Ness seems to be in a perpetually complimentary state, frequently interrupting himself or others to say something along the lines of “Um, P.S., your center-part bob is so fierce.” It’s his genuine kindness that makes him a natural-born connector, a trait that serves him well as a hairdresser, TV star, newly minted international gay icon, and, of course, as a traveler. “I’ve been behind the chair, doing hair five days a week since I was 18 years old. So the concept of meeting a client, working with them, and getting a result comes extremely naturally to me,” he says. But just as he can sometimes be all over the place verbally, Van Ness doesn’t tend to physically stay in one place very long. Raised in Illinois, he attended cosmetology school in Arizona where, once he moved to Los Angeles to work as an assistant, he would return every weekend to see past clients. When his late stepdad got sick with bladder cancer, he flew back and forth between L.A. and St. Louis to work on clients closer to home without alienating those back on the West Coast. “It’s extremely important to me as a hairdresser to get to connect with people face-to-face,” he says. 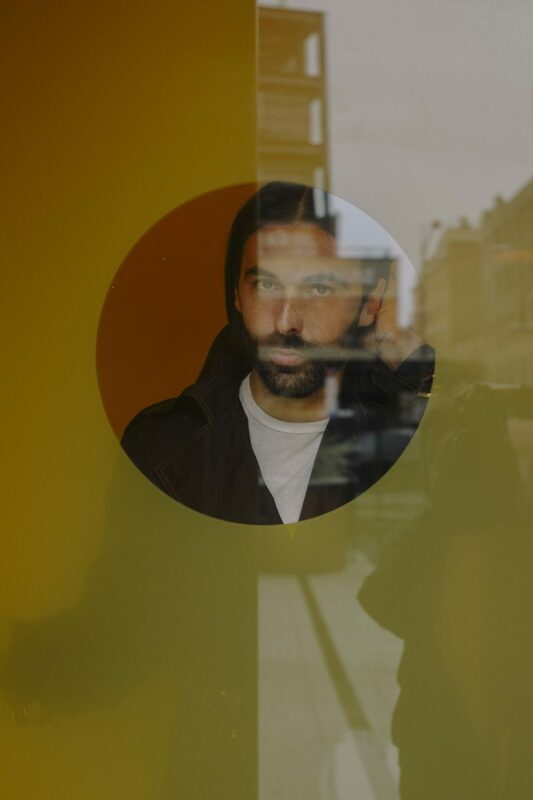 Now, in the months following Queer Eye’s debut, he splits his time between L.A. and New York, cutting hair when he can and managing his new life in the limelight. As we talk, he reveals that the tan I’m admiring is the result of a recent Hawaiian vacation, one of the few non-work trips he’s been able to take since the success of the Netflix series. Turns out, fame presents an all-new set of advantages and challenges when it comes to connecting with others—and with oneself. As we’re stopped several times in the lobby of New York’s Standard, High Line hotel by admirers who ask for selfies and hair advice, I get the sense that his popularity has already made it impossible for him to disconnect. He doesn’t mind, though. “It is such a massive honor to have people react to you like that,” he says. It would seem that all of his travels back and forth, plus his budding celebrity status, might threaten his relationships. But Van Ness isn’t too worried about that—he can “chat on the phone like nobody’s business.” And as for his relationship with himself? “I’m really into routine—I love going to the gym, I love going to yoga. Also, continuing to do hair and to stay in the salon in some way so that I can be around those friends and clients and coworkers who I’ve known for so long helps me.” Between his clients in L.A. and his “heroes” in Georgia, plus his fans on Instagram and the guests on his podcast, “Getting Curious,” Van Ness’s professional connections provide an endless well of stimulation. They also make his personal time—whether on vacation in Hawaii, in shavasana pose, or in his bedroom with his two cats, Harry Larry and Love Bug—all the more nourishing. At New York’s Standard, High Line Hotel, built in 2009, guests are ushered in through a striking, yellow revolving door. After 30 seconds with the man I already feel connected to him, too. His quirks are infectious; by the end of our morning together, I’m fighting the urge to refer to absolutely everything (down to the room service salmon sandwich) as “she” and “her” and as “fierce” or as “having a moment.” Outside, near the West Side Highway, our photographer instructs Van Ness to “have a little fun” with his poses. Before she has time to walk the 15 feet back to her camera, Van Ness has clawed his way up the side of the chain-link fence behind him. And maybe it’s the way he’s clinging to the fence with one hand and gracefully propping up his umbrella with the other—as though he has just floated down from the heavens and stuck his landing on the abandoned construction site that we’ve converted into a set—but the congruity of this modern-day Mary Poppins look is not lost on me. Queer Eye has been celebrated for using its platform and setting in the South to address, if sometimes clumsily, intersecting social issues including racism, police brutality, and religious bigotry. “It’s about going to places that are maybe not so accepting and trying to find the grounds that you can connect on as opposed to fighting or really living in your separation,” he says. “Queer Eye asks you to see if you can get to know your connections.” For Van Ness, however, there’s still no denying that there is plenty of work to be done in addressing the pain of marginalized communities. Van Ness knows how to have fun with his poses, like climbing up onto a chainlink fence and serving us Mary Poppins realness. Styled by Mel'Renee Leamon. Grooming by Jennifer Brent for Exclusive Artists using Trish McEvoy and Kevin Murphy. For Van Ness, his community reminds him of his place within the larger solution, especially considering his new status as a public figure with an incessantly tuned-in audience. “Every time I see something that makes me feel hopeless, I’ll see a DM from somebody who says, ‘You just inspired me to come out to my parents,’ and I’m like, ‘Oh, my gosh, we are getting somewhere, we are doing something.’” It doesn’t all happen on social media, though; he’ll also take to the streets with his community to support a cause, like the AIDS Walk New York, which he attended this year alongside friends and fellow Queer Eye cast members Antoni Porowski and Tan France. Though he doesn’t have much time anymore for personal travel aside from the occasional Hawaiian escape, Van Ness, like the rest of us, still daydreams about future trips. He’s longed to visit Finland since the fifth grade, when he had a Finnish teacher who got him hooked on the idea of reindeer and the Northern Lights. It’s comforting to know that Van Ness’s “character” on Queer Eye is an honest reflection of who he is when the cameras are shut off. In person, he elevates the collective mood as effortlessly as he pulls off a fierce blowout, and his aptitude for connection keeps him searching for the best in people (and places), even if it seems that they are predetermined to clash. At the end of our morning together, he scrolls through the images in search of a still to send to Porowski, who’s asking how the shoot is going. When he arrives at the Mary Poppins chain-link moment, he exclaims through giggles: “She’s climbing the fences, honey! As fast as you can put ’em up, I’m gonna climb them!” Nothing can fence him in—not adversity, gender roles, or ideological differences. 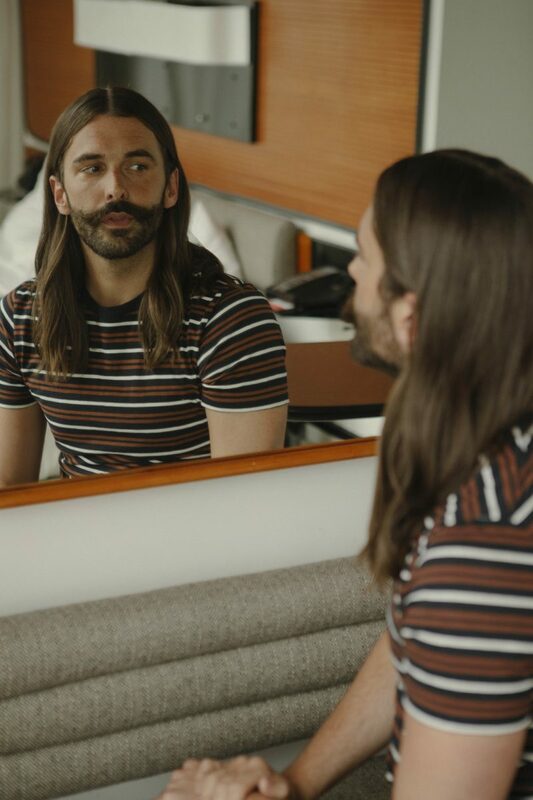 That’s the magic of Jonathan Van Ness: He has no barriers.